We are a 100% New Zealand owned and operated business based in Thames. We service Hauraki, Northern Waikato and Coromandel districts. As members of the Waste Management Institute of New Zealand we have a strong commitment to sustainability and care for our Environment. We have a professional health and safety regime and a strong commitment to ensuring the safe wellbeing of our staff and the general public. Our services include providing 120 litre and 240 litre residential wheelie bins. We also offer unique Holiday Home owners on demand back door service that takes all the hassles out of Holiday rubbish. We hire skip bins in 3 different sizes and provide effective waste solutions to local commercial businesses. View our site, we’d be happy to hear from you. Heres a few reasons why you would choose us over our competition. We are based in Thames, and know our way around the Coromandel and Hauraki. Its always much easier to deal with someone who is from the area. We pride ourselves on being reliable and delivering exactly what we promise, no excuses just the job done properly. All our trucks are GPS tracked and have the latest on-board mapping systems. We can even see when they arrive at your gateway and when they leave. Our team has over 30 years combined experience dealing with Bins and Rubbish, we are happy to help make sure that you get the right bin for the job. 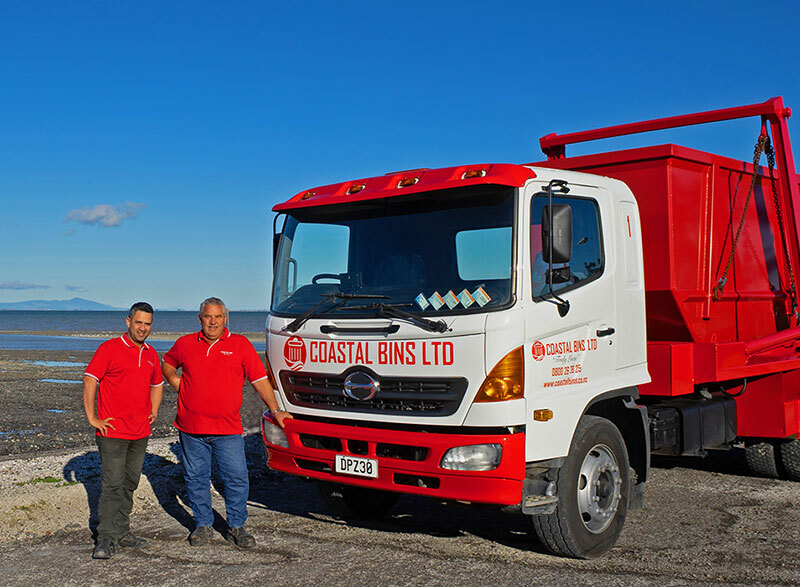 Coastal Bins Limited is a 100% New Zealand owned and operated local business, we are proud kiwis getting the job done. Unlike some of our competition, we list our prices clearly on our website. We make sure it is all easy to understand, with clear terms and conditions. Need a Bin, Call us now! We have a wide range of bins and pickup schedules to suit almost everyone. Do away with purchasing bags for a cleaner, easier and cheaper option. Get a Red Bin from Coastal Bins and look at our user-friendly options: Two wheelie bin sizes 120 litre (2.5 bags) and 240 litre (5 bags), Two collection frequencies either weekly pick up or fortnightly pick up. 4.5m, 6m and 9m bins available, check out our rates and deals, unlike most, we are happy to show you our prices. We will also do assisted loading, where we deliver the bin and help you fill it. Eftpos available in the truck for hassle-free payment. Talk to us about your long-term rubbish disposal requirements, we can customize a solution that takes the hassle of dealing with your general waste. At Coastal Bins we are a friendly practical lot, our aim is to make your rubbish problems go away. Murray has had 18 years’ experience in the waste industry. Formally an Operations Manager overseeing the Hamilton City and Waikato District Council kerbside contracts. This was followed by 6 years setting up his own waste company in Te Awamutu, that won the prestigious ‘Waipa Supreme Business Award’ in 2008. Murray was also a Finalist for the ‘Waikato Business Leader of the Year’ in 2009. This successful business was sold in 2012. Murray was attracted back to the Coromandel area to become the local Area Manager for a waste company based in Thames, a position he held for 16 months. “Unfortunately that role didn’t work out for me, but I loved the area so much I wanted to stay. Starting Coastal Bins allows me to continue in the industry I enjoy as well as reside in the best place this great country has to offer”. Murray and his school teacher wife Kirsty live on a lifestyle block at Turua. Both are keen fisher people, when not tending to their Hereford cattle and developing their block. Murray and Kirsty have six children and eight grandchildren. Murray was born and bred in Te Awamutu, he started his working career in the NZ Army and is a qualified diesel mechanic. To be “Truly Local” you don’t have to look any further than Michael Barlow. Born and bred in Thames, he has lived 38 of his 42 years in the Thames Coromandel/Hauraki Area, He attended Thames South School then onto Thames High School and to this day he still calls his Teachers Mr and Mrs, that’s how much respect he still has for them all. Michael says his working career started off slowly, not wanting to work, just wanting to have fun. Eventually he did say hello to the work force, where he literally jumped over the fence from his Grandmothers on Ngati Maru Highway to Wallace Meats (formally Coromandel Meat Processes). This is where he made his home for the next 11 years, from handing out overalls, cleaning locker rooms to eventually becoming Site Manager. Michael’s next local job was in the Waste Industry, overseeing 14 Transfer Stations and District Wide Kerbside Waste and Recycle Collections on behalf of Thames Coromandel, Hauraki and Matamata-Piako District Councils. Eventually he would be handed the reigns in South Waikato looking after Kerbside Recycling collections on behalf of the Waipa District Council. His last role was as Operations Manager. This role covered all of the above and also included a Materials Recovery Facility as well as some aspects of Commercial waste. During his time in the waste industry, Michael says he has met some wonderful people, from the top of the Coromandel to the bottom of the Waipa District, “Starting Coastal Bins with Murray, gives me the opportunity to further these connections but also allows me to continue in an Industry that I am so passionate about” say’s Michael. Michael is married to Stella and has 6 children. Michael is currently Chairperson for Te Tonga O Hoterini Kohanga Reo, located in the old Dental Clinic at Thames South School; he also sits on the Establishment Board of the Thames Business Association. Michael loves fishing with whanau and friends and is an avid supporter of the Wish 4 Fish Charity. We have owned a holiday home at Whitianga for 10 years. Our biggest headache was always the rubbish when packing up. Often we hadn’t purchased council bags, often the transfer station was closed and often we had to take the smelly stuff home with us. Then we heard of Coastal Bins unique Holiday home owner’s back door service. WOW, what a breath of fresh air. We ordered and paid for our bin online, easy and simple. Then we received the bin with a plastic liner, and also a cute little wheelie bin fridge magnet with our own pin number. Now it’s so simple when we leave to go home will simply text our pin number to Coastal Bins dedicated text line and that’s it. We get a confirmation text back that the bin is booked for service. When we get back to the beach, the empty bin with a fresh clean liner is waiting at the back door to greet us. Wow, what a service and the best part is that we choose when we want it, Keep it up Coastal Bins, you guys rock!!! We live down a side road off the main road, in the country. We do not get a Council rubbish collection and disposing our waste was always a problem. Then we heard about Coastal Bins. I made some enquiries and the guys at Coastal Bin were real helpful. I ordered and paid for my bin on line, it was an easy and simple experience. Now I simply put out my Coastal Bins at the gate every week and the truck comes along and empties it. We wouldn’t be without our Coastal Bin and recommend there outstanding service. Amazing service, thank you so much for still collecting my Bin today as I had totally forgot to put it on the roadside this morning, but you guys went above and beyond and still went in and collected awesome stuff!! Got a question about our services, send us a message we are happy to help.